The customers in the heavy duty vehicle market are asking for low fuel consumption, as it is one of the key factors in the vehicle Total Cost of Ownership. On top of that, the European Commission has set challenging targets on the CO2 emissions of Heavy Duty Vehicles in 2025 and 2030. For these reasons, the heavy duty truck demonstrator is focusing on a significant driveline efficiency improvement with minimized cost increase. To address these challenges, the heavy duty truck demonstrator has a parallel hybrid powertrain and a combined waste heat recovery system. 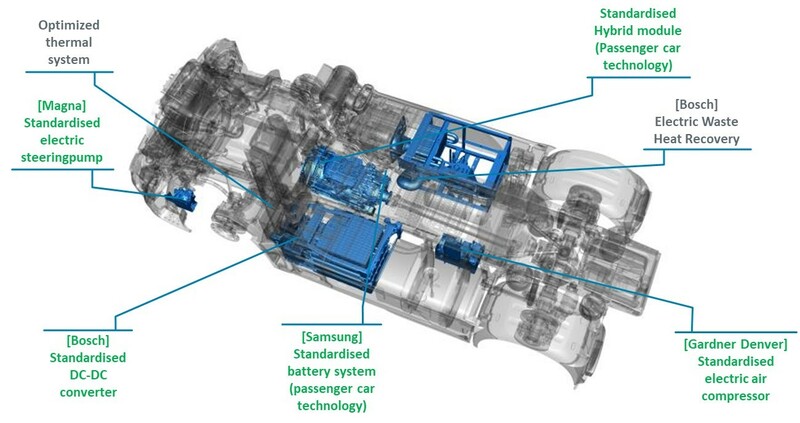 Increased powertrain efficiency is gained from downsizing of the combustion engine and the hybrid electric components. The energy management system optimizes the trade-off between using the combustion engine, auxiliaries and electric motor, minimizing the overall energy losses. The combination of a waste heat recovery system with the hybrid system offers freedom to store the generated energy from otherwise wasted heat. 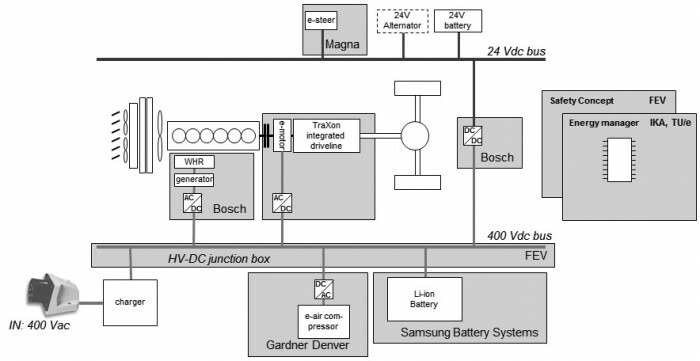 This enables the hybrid system to use the stored energy at a later moment or to use it directly for auxiliary power supply, resulting in an improvement of the overall fuel economy. A delay in response time of thermodynamic systems, such as the waste heat recovery system, results in a delay in the availability of thermal energy that is converted to drive power, reducing the potential of the waste heat recovery system. The costs are addressed by applying standardized, modular hybrid components that were developed for high volume produced passenger car components, based on the established 400 V technology. The main targets of the demonstrator are listed in below. The DAF XF demonstrator is based on a DAF XF tractor unit and has a parallel hybrid architecture. The powertrain is optimized by using hybrid driveline components, the thermal energy of the waste heat recovery, the electrified auxiliaries and the optimized energy manager. The Samsung HV battery is a key feature of the hybrid powertrain. The battery pack consists of several modules and can easily be extended, making it consistent with the MSF modularization concept. The pack consists of LiPF6 battery cells, each with a with capacity of 28 Ah. The battery can deliver a useable energy of 16 kWh at a nominal voltage level of 300 V (the voltage range is 250 – 350 V). The battery can only deliver power to electric components if they are in the voltage range of the battery pack. When the high voltage system was designed and integrated, the proposed voltage levels appeared to be partially outside this range. 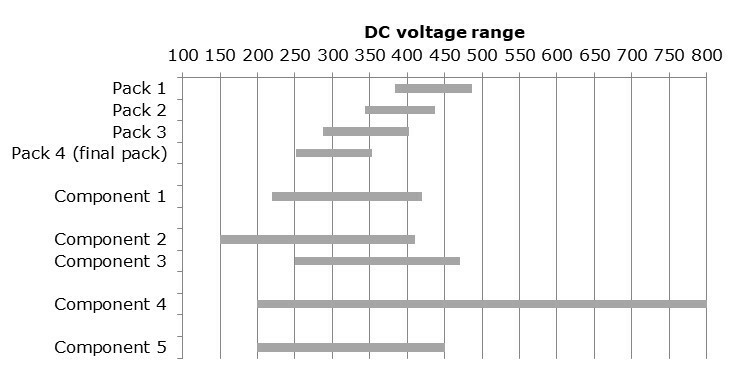 For that reason, the voltage levels of the different components needed alignment. Hence, the battery pack has been tuned to a level where all components align with this setting. The electric motor is developed outside the ECOCHAMPS project. Nonetheless, the E-machine and the dedicated inverter have been developed with the ECOCHAMPS philosophy to be compliant with the overall goals, using standardized components of the passenger car industry. The electric motor is a permanent magnet synchronous machine, with a mechanical peak power of 100 kW, a peak torque of 250 Nm and an integrated reduction transmission bringing the peak torque at 750 Nm. The e-motor is strong enough to fully drive the heavy duty truck, without support from the internal combustion engine. As the e-motor was designed for passenger cars, the peak output currents from the inverter is too low for a heavy duty vehicle to drive-off fully electric from standstill, and therefor it needs the internal combustion engine to assist. During high way use-cases the vehicle is able to stop the internal combustion engine and fully drive on the E-machine thereby eliminating the internal friction from the engine and thus saving additional fuel. The electric Waste Heat Recovery (e-WHR) converts the heat from the vehicle exhaust system into electrical energy, and so helps to improve the efficiency. The e-WHR is based on the Rankine Cycle and uses an evaporator to heat a fluid with the heat from the vehicle exhaust gas. The heated fluid is then fed into the expander unit, where a generator converts the thermal energy into AC electrical energy. An inverter converts the AC power into DC power, after which it is stored in the HV battery system. The energy can then be used for powering the E-machine or the air compressor. On heavy duty vehicles, the air compressor provides pressurized air to operate the brakes. Conventional air compressors are driven by the internal combustion engine.To enable pure electric driving, an electric air compressor is needed. Therefore, in ECOCHAMPS an optimized electric air compressor has been developed and is used both for the bus and for the truck. The ECOCHAMPS e-motor and controller are 50 % and 75 % lighter compared to the original e-motor and controller, respectively. Similar to the air compressor, a conventional hydraulic steering pump normally driven by the combustion engine. In ECOCHAMPS, an electro hydraulic steering pump (EHSP) has been developed. The EHPS unit is connected to the 24 V DC boardnet as the required DC current is relatively low. The DC/DC converter was developed to convert the 300 V DC from the high voltage battery to a 24 V DC (low voltage) level to supply the board net with electrical power. This converter avoids to use of an alternator and is able to convert a maximum of 3 kW electrical power from the high voltage to the low voltage boardnet on a higher efficiency. 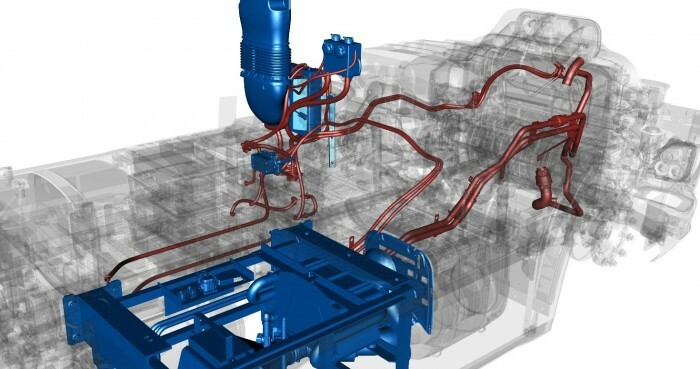 The energy management for the hybrid truck has a generic, modular approach, so it can be used for various powertrain topologies with differently dimensioned components. 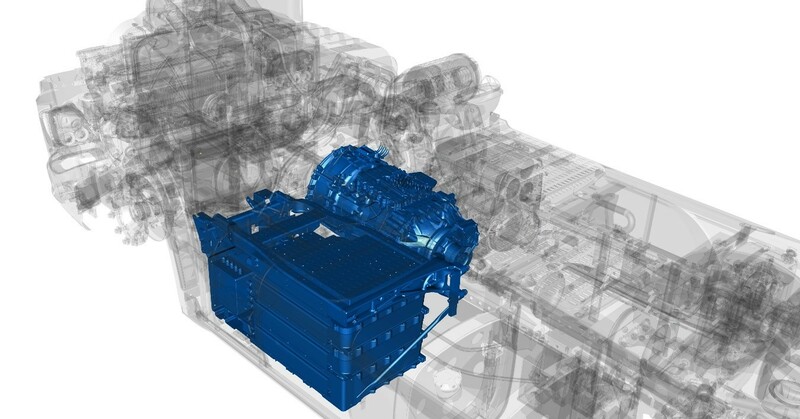 This solution is demonstrated for the first time in the ECOCHAMPS hybrid truck. The generic energy management can use preview information (available road/route information) as well as historical data to optimise the overall powertrain efficiency. The ECOCHAMPS DAF-XF-FT Super Space Cab was assessed in March 2018 at the DAF facilities in Eindhoven (The Netherlands) under the supervision of the Golden Engineer. Table 5‑22 and Table 5‑23 summarize the main results. In 2013 there were no hybrid long haul trucks available in the market, so several vehicles were used to compare the demonstrator to the 2013 state-of-the-art. The DAF-XF-FT Super Space Cab MX-11 320 kW MY2017 was used as a base vehicle, the DAF-XF-FT Super Space Cab MX-13 340 kW MY2013 was used as a reference for powertrain efficiency and the DAF XF-FT Convenient demonstrator was used as a reference for the hybrid powertrain. The ECOCHAMPS DAF-XF-FT Super Space Cab is significantly more fuel efficient than the reference, consuming about 14.5 % less energy (simulated on the DAF proprietary test cycle), which is equivalent to a powertrain energy efficiency improvement of about 17.4 % with a loaded vehicle (average loading factor). The electric part of the hybrid powertrain of the demonstrator is 37.7 % smaller (volume) and 43.7 % lighter (weight) than the reference vehicle, increasing the volumetric and gravimetric peak power and torque by 40 %. Overall CO2 emissions are expected to be reduced, consistent with the lower fuel consumption. Furthermore, compliance with in-force EURO VI emissions regulation is expected. The demonstrator meets or exceeds part of the performance parameters, can maintain a cruise speed of 85 km/h in four traction configurations (i.e. 16 tons/40 tons, ICE and hybrid-powered configurations), accelerates satisfactory and has an electric range of 14 km (at a constant speed at 50 km/h). Comfort, ride, handling and NVH performance are fully satisfactory, being equal to or better than the reference. The demonstrator meets required safety standards, reliability and durability requirements, is easy to operate and recharge, and is equipped with a clear and intuitive interface to give the driver relevant information on the functioning of the hybrid powertrain. The tests also highlighted areas of possible further improvements, e.g. a fully functioning WHR system, to further improve the fuel efficiency. In conclusion, the assessment is positive. The DAF-XF-FT Super Space Cab meets most of the targets set for the project, and is an advancement beyond the 2013 state of the art. It allows DAF to increase its vehicle portfolio, with a product that is fairly close to market deployment. The overall TRL of the demonstrator is evaluated at TRL 7 (system prototype demonstration in operational environment), with exception of the WHR system, which is evaluated at TRL 6, (technology demonstrated in relevant environment).